1.2 How to cook semolina with milk? 2 How to cook porridge in multivarka? Semolina - is one of the most delicious. If someone does not like it and, the, probably, Only because of the lumps. 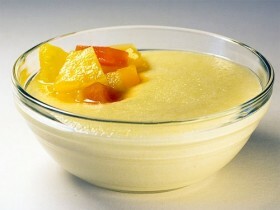 Liquid semolina porridge are used as the dietary food. semolina, boiled in milk, it is not recommended to cook for children up to three years, tk. it contains substances, which may adversely affect the performance of the small intestine of the child. Before, how to cook porridge, should make sure, that the shelf life of cereals has not yet expired. Otherwise, the porridge will be hazardous to health. For cooking, you need to take an aluminum pot, tk. in containers of other metals semolina quickly undercooked. As it translates one glass of water and brought to a boil. Then to add sugar and salt. Next is poured a thin continuous stream of semolina. Within three or four minutes, porridge cooked on the stove, in this case it is necessary to stir, without ceasing. Then remove from heat porridge, the lid and remains on 5-7 minutes to infuse. After that it can bring to the table. At the request of cut fruits added to the porridge. How to cook semolina with milk? Pot for cooking is better to take with thick walls. As it pours 1 a liter of milk. you must wait, when it comes to a boil, To add to semolina. A specified amount of milk needed 6 tablespoons of cereal. Absorb grits need a continuous stream, certainly stirring, to avoid the appearance of lumps in the porridge. At this stage you need to add salt to taste and a few spoonfuls of sugar. they, who can not be sweet, can reduce the amount of sugar or no added. 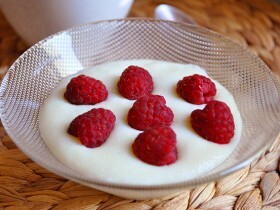 It can be sweetened with a ready-made porridge directly on the plate. How to cook porridge mentioned earlier: approximately 6-7 minutes, stirring spoon. After turning off the fire porridge with milk, too, must stand, covered, for about 10 minutes. Very tasty turn, if you add the pumpkin porridge. It is prepared separately. The rind is cut, seeds removed. Further pumpkin is heat-treated and cut into cubes, and are subsequently mixed with semolina. Pumpkin sweet enough, so I put a lot of sugar in cooked her porridge is not necessary. 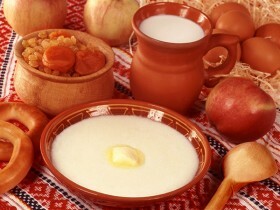 How to cook porridge in multivarka? How to cook millet porridge?